Background: Ribosomal protein L26 (RPL26) is a component of the 60S ribosomal subunit and is involved in translation (1,2). It was shown that RPL26 increases the translation of p53 mRNA by binding to its 5' untranslated region (UTR) after DNA damage. 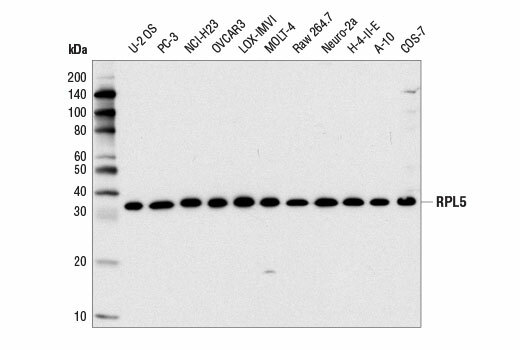 Studies found that overexpression of RPL26 enhances the binding of p53 mRNA to the ribosomes and increases p53 translation. Overexpression of RPL26 also induces cell-cycle arrest at G1 phase and increases radiation-stimulated apoptosis (2). 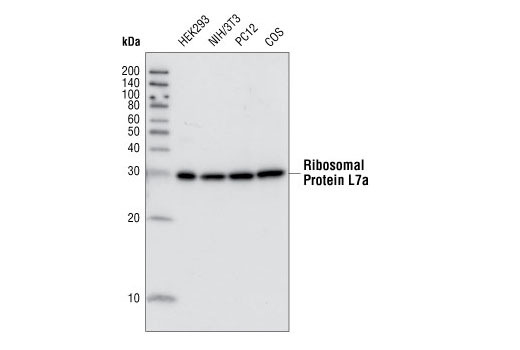 Background: Ribosomal protein L7a is a highly conserved ribosome protein localized to 60S ribosomal subunit (1). The protein has distinct domains that target the newly synthesized polypeptide to nucleus and the nucleoli, the site of ribosome biosynthesis (2). 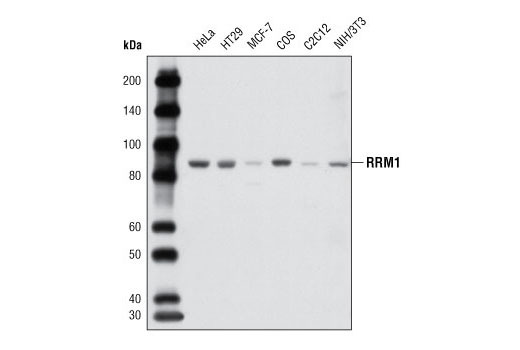 Ribosomal protein L7a can also interact with RNA in vitro through two distinct RNA-binding domains in the protein (3). Taken together, nucleolar localization and the ability to bind RNA suggests that ribosomal protein L7a may act as an important component for ribosome biosynthesis and function. Background: Ribosomal protein S3 (rpS3) is a component of the 40S ribosomal subunit and is involved in translation. 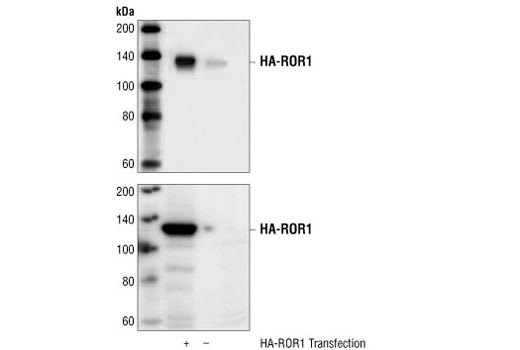 HSP90 interacts with both the amino-terminus and carboxy-terminus of rpS3, preventing its ubiquitination and degradation and thereby retaining the integrity of the ribosome (1). rpS3 has also been shown to function as an endonuclease during DNA damage repair (2,3). 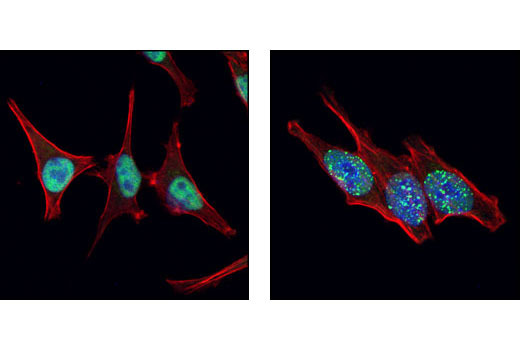 Furthermore, overexpression of rpS3 sensitizes lymphocytic cells to cytokine-induced apoptosis, indicating a third role for rpS3 during apoptosis (4). 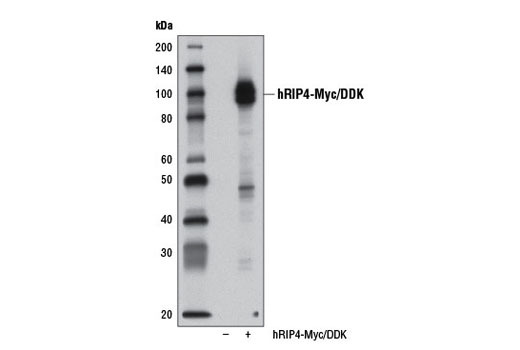 The functions of rpS3 during DNA damage repair and apoptosis have been mapped to two distinct domains (4). Background: Cell growth is a fundamental biological process whereby cells accumulate mass and increase in size. The mammalian TOR (mTOR) pathway regulates growth by coordinating energy and nutrient signals with growth factor-derived signals (1). 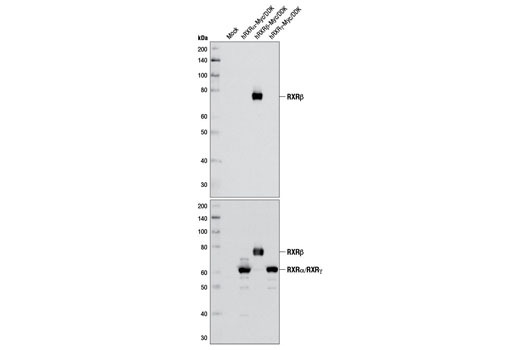 mTOR is a large protein kinase with two different complexes. One complex contains mTOR, GβL and raptor, which is a target of rapamycin. The other complex, insensitive to rapamycin, includes mTOR, GβL, Sin1, and rictor (1). 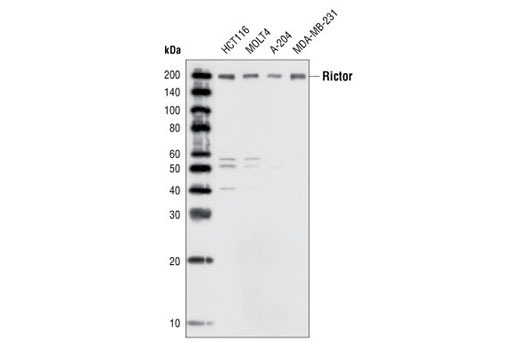 The mTOR-rictor complex phosphorylates Ser473 of Akt/PKB in vitro (2). This phosphorylation is essential for full Akt/PKB activation. 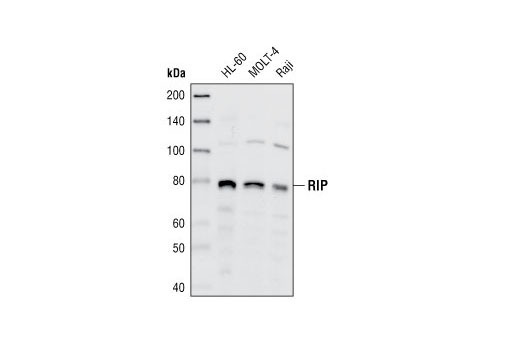 Furthermore, an siRNA knockdown of rictor inhibits Ser473 phosphorylation in 3T3-L1 adipocytes (3). This complex has also been shown to phosphorylate the rapamycin-resistant mutants of S6K1, another effector of mTOR (4). Background: Ring1A plays a role in polycomb group (PcG) protein function. PcG proteins are critically involved in transcriptional repression of Hox genes during development (1,2). 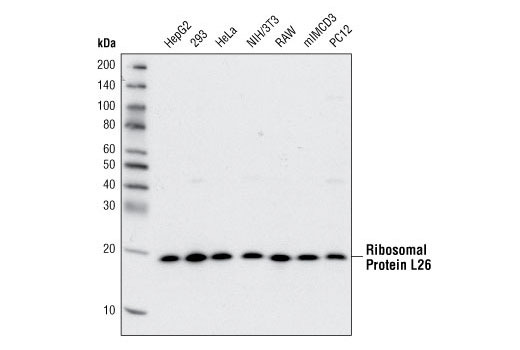 PcG proteins form two distinct complexes: EED-EZH2 and the PRC complex, which is composed of at least Bmi1 and Ring1A/Ring1B. 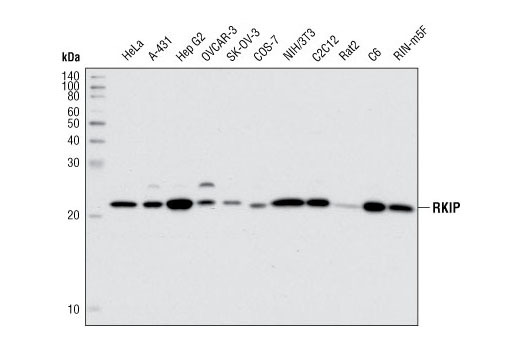 The EZH2-containing complex is responsible for the methylation of H3K27, and the PRC complex ubiquitylates H2A. EZH2 methylation is required prior to PRC ubiquitylation, and both are essential for Hox gene repression (3). It has recently been shown that PcG proteins silence a group of developmentally important regulator genes, referred to as bivalent genes (4). This regulation may be responsible for the ability of stem cells to self renew or switch to differentiate into multipotent progenitors. Aberrant epigenetic silencing by PcG proteins is also thought to be important in tumorigenesis (5). Background: Raf kinase inhibitor protein (RKIP) is a member of the phosphatidylethanolamine-binding protein (PEBP) family that associates with Raf-1 and the MEK and MAP kinases (1). 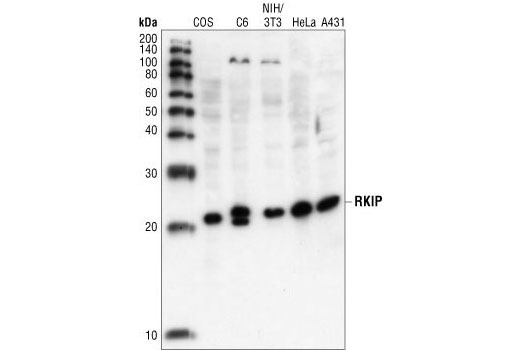 RKIP has been shown to form a complex with Raf-1, MEK, and Erk (2). Although MEK and Erk can simultaneously bind RKIP, the association between Raf-1 and RKIP and that of RKIP and MEK are mutually exclusive. Thus, RKIP competitively disrupts the Raf-1-MEK complex and effectively terminates signal transmission from Raf-1 to MAP kinases (2). The inhibitory effect of RKIP on MAP kinase signaling is eliminated by PKC phosphorylation of RKIP at Ser153 (3). PKC phosphorylation on Ser153 also promotes the association of RKIP with GRK2, which prevents GRK2-dependent internalization of GPCR (4). RKIP also interacts with modules of the NF-κB pathway, including NF-κB-inducing kinase (NIK), TAK1, IKKα and IKKβ (5). These interactions antagonize cytokine-induced activation of the NF-κB pathway (5). Restoration of RKIP expression is associated with the inhibition of prostate cancer metastasis, implying that RKIP may be a potential clinical target as a suppressor of tumor metastasis through inhibition of vascular invasion (6). Background: ROCK (Rho-associated kinase), a family of serine/threonine kinases, is an important downstream target of Rho-GTPase and plays an important role in Rho-mediated signaling. Two isoforms of ROCK have been identified: ROCK1 and ROCK2. ROCK is composed of N-terminal catalytic, coiled-coil, and C-terminal PH (pleckstrin homology) domains. The C-terminus of ROCK negatively regulates its kinase activity (1,2). 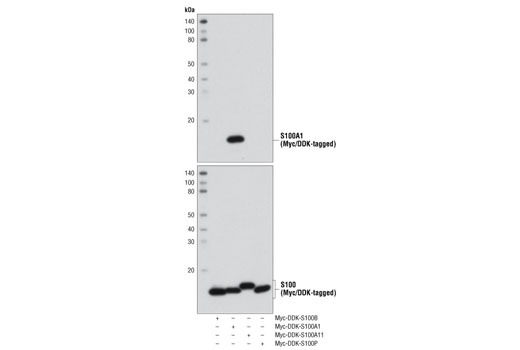 Caspase-3-induced cleavage of ROCK1 and direct cleavage of ROCK2 by granzyme B (grB) activates ROCK and leads to phosphorylation of myosin light chain and inhibition of myosin phosphatase (3). This phosphorylation may account for the mechanism by which Rho regulates cytokinesis, cell motility, cell membrane blebbing during apoptosis, and smooth muscle contraction (4-6). 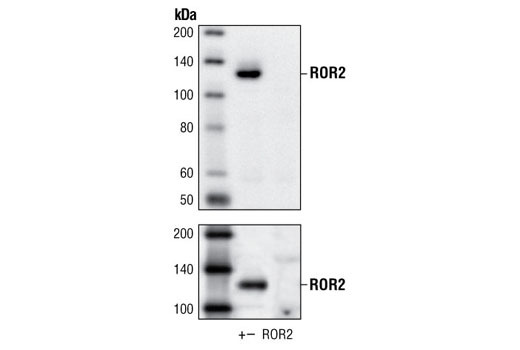 Background: ROR1 and ROR2 are orphan receptor tyrosine kinases that are most closely related to MuSK and the Trk family of neurotrophin receptors. They are characterized by the presence of extracellular frizzled-like cysteine-rich domains and membrane-proximal kringle domains, both of which are assumed to mediate protein-protein interactions (1-3). The ROR family RTKs are evolutionarily conserved among Caenorhabditis elegans, Drosophila, mice, and humans (1,4). Although the functions of ROR kinases are unknown, similarities between ROR and MuSK and Trk kinases have led to speculation that ROR kinases regulate synaptic development. CAM-1, a C. elegans ortholog of the ROR family RTKs, plays several important roles in regulating cellular migration, polarity of asymmetric cell divisions, and axonal outgrowth of neurons during nematode development (4). mROR1 and mROR2 may play differential roles during the development of the nervous system (5). Background: RPA70 (HSSB, REPA1, RF-A, RP-A, p70) is a component of a heterotrimeric complex, composed of 70, 32/30 and 14 kDa subunits, collectively known as RPA. 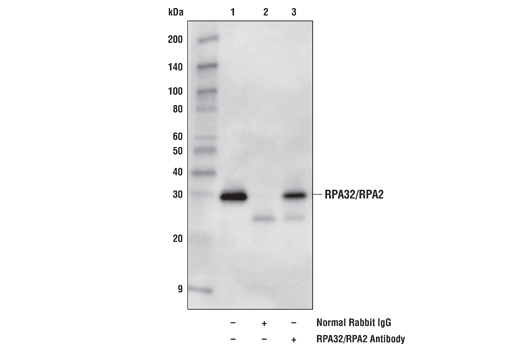 RPA is a single stranded DNA binding protein, whose DNA binding activity is believed to reside entirely in the 70 kDa subunit. The complex is required for almost all aspects of cellular DNA metabolism such as DNA replication (1-3), recombination, cell cycle and DNA damage checkpoints, and all major types of DNA repair including nucleotide excision, base excision, mismatch and double-strand break repairs (4-7). In response to genotoxic stress in eukaryotic cells, RPA has been shown to associate with the Rad9/Rad1/Hus1 (9-1-1) checkpoint complex (8). 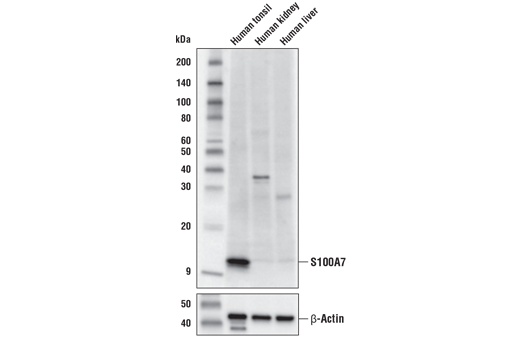 RPA is hyperphosphorylated upon DNA damage or replication stress by checkpoint kinases including ataxia telangiectasia mutated (ATM), ATM and Rad3-related (ATR), and DNA-dependent protein kinase (DNA-PK) (9-11). Phosphorylation of RPA32 occurs at serines 4, 8 and 33 (11). Hyperphosphorylation may alter RPA-DNA and RPA-protein interactions. 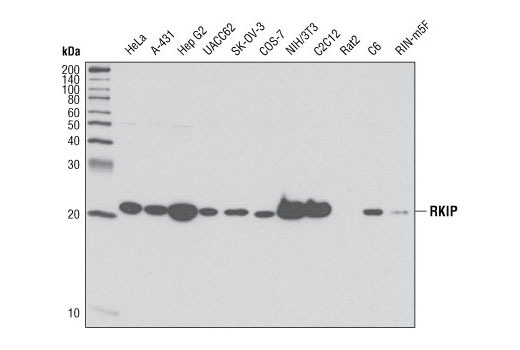 In addition to the checkpoint partners, RPA interacts with a wide variety of protein partners, including proteins required for normal replication such as RCF, PCNA and Pol α, and also proteins involved in SV40 replication, such as DNA polymerase I and SV40 large T antigen (10,12). Background: Ribosomal protein L5 (RPL5) is one of several proteins that comprise the 60S ribosomal subunit. 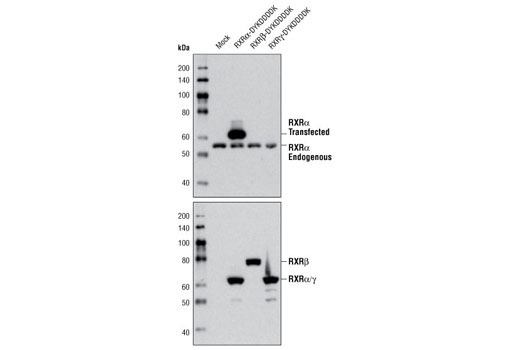 RPL5 binds 5S rRNA and the nucleolar RPL11 protein to form the 5S ribonucleoprotein particle (RNP) that is incorporated into the large 60S ribosomal subunit (1). 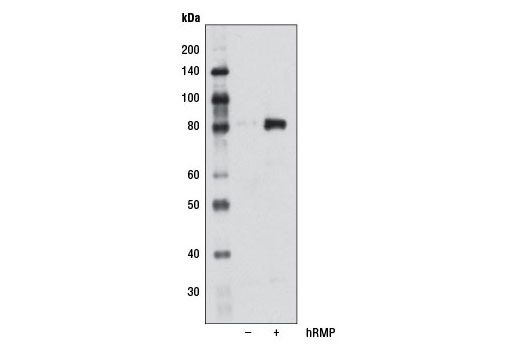 An RP-MDM2-p53 protein complex that contains ribosomal proteins RPL5, RPL11, and RPL23 acts as a nucleolar stress sensor that binds and inhibits MDM2 ubiquitin ligase activity and enhances p53-mediated transcriptional activity (2,3). RPL5 cooperates with RPL11 to influence ribosome biogenesis through regulating expression of the transcription factor c-Myc, which acts as the master regulator of ribosome biogenesis (4). Mutations in the corresponding RPL5 gene are associated with Diamond-Blackfan anemia, which is a form of red blood cell aplasia, and some cases of pediatric T-cell acute lymphoblastic leukemia (5,6). 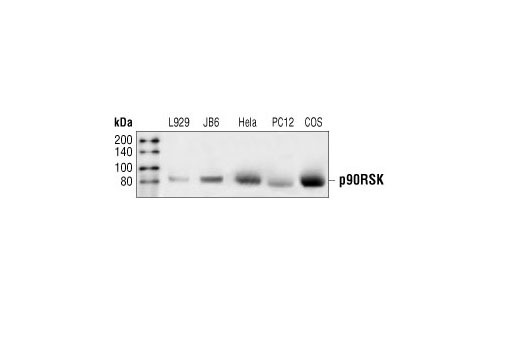 Background: The 90 kDa ribosomal S6 kinases (RSK1-4) are a family of widely expressed Ser/Thr kinases characterized by two nonidentical, functional kinase domains (1) and a carboxy-terminal docking site for extracellular signal-regulated kinases (ERKs) (2). Several sites both within and outside of the RSK kinase domain, including Ser380, Thr359, Ser363, and Thr573, are important for kinase activation (3). 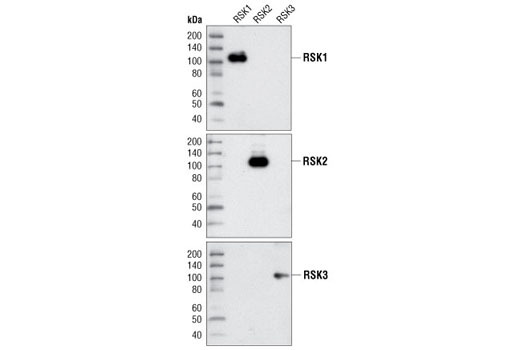 RSK1-3 are activated via coordinated phosphorylation by MAPKs, autophosphorylation, and phosphoinositide-3-OH kinase (PI3K) in response to many growth factors, polypeptide hormones, and neurotransmitters (3). Background: The human retinoid X receptors (RXRs) are encoded by three distinct genes (RXRα, RXRβ, and RXRγ) and bind selectively and with high affinity to the vitamin A derivative, 9-cis-retinoic acid. RXRs are type-II nuclear hormone receptors that are largely localized to the nuclear compartment independent of ligand binding. Nuclear RXRs form heterodimers with nuclear hormone receptor subfamily 1 proteins, including thyroid hormone receptor, retinoic acid receptors, vitamin D receptor, peroxisome proliferator-activated receptors, liver X receptors, and farnesoid X receptor (1). Since RXRs heterodimerize with multiple nuclear hormone receptors, they play a central role in transcriptional control of numerous hormonal signaling pathways by binding to cis-acting response elements in the promoter/enhancer region of target genes (2). 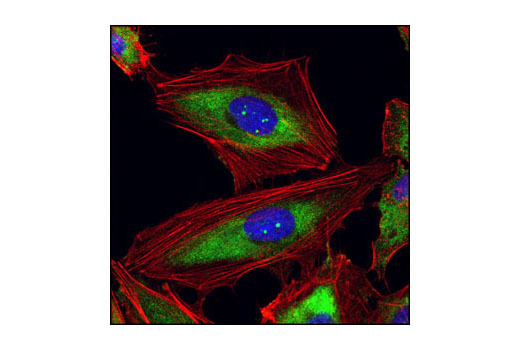 Background: Ring1 and YY1-binding protein (RYBP) is a widely expressed nuclear protein that functions as a modulator of Ring1A/Ring1B-dependent histone H2A monoubiquitylation (1-3). 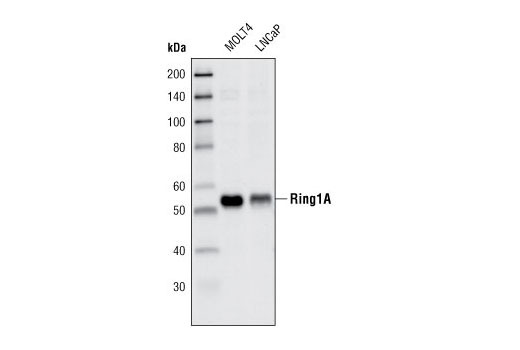 Ring1A and Ring1B proteins function as the catalytic core subunits of polyclomb repressor complex 1 (PRC1), which acts to repress gene expression in part through monoubiquitination of histone H2A on Lys119 (4). 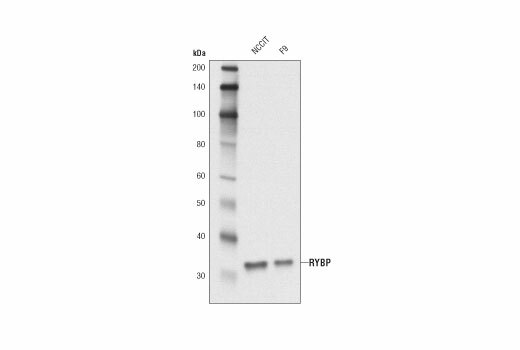 By binding to both the YY1 DNA-binding transcription factor and Ring1A/Ring1B, RYPB is able to recruit the PRC1 complex to target loci independent of prior tri-methylation of histone H3 Lys27 by the EZH2-dependent PRC2 complex (2,3). RYBP also binds monoubiquitinated H2A Lys119 and may act to stabilize or spread binding of PRC1 across large domains of repressed chromatin (5). In addition, RYBP directly stimulates the ubiquitination activity of Ring1A/Ring1B and is required for proper differentiation of stem cells along multiple cell lineages (2,3,6,7). 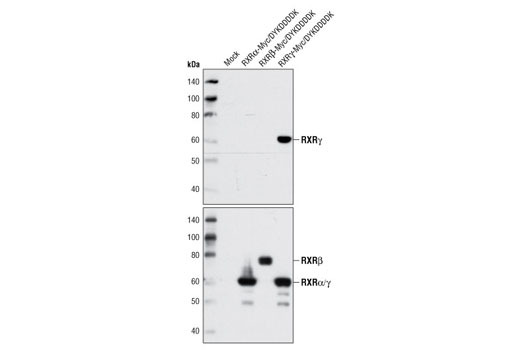 RYBP has also been shown to bind MDM2 and block ubiquitination and degradation of p53, leading to cell cycle arrest and apoptosis in response to DNA damage (8). Many studies demonstrate that RYBP functions as a tumor suppressor protein. RYBP expression is decreased in multiple cancers, including non-small cell lung cancer, hepatocellular carcinoma, and glioblastoma with decreased expression correlating with metastasis and poor prognosis (8-11). Background: Despite their relatively small size (8-12 kDa) and uncomplicated architecture, S100 proteins regulate a variety of cellular processes such as cell growth and motility, cell cycle progression, transcription, and differentiation. To date, 25 members have been identified, including S100A1-S100A18, trichohyalin, filaggrin, repetin, S100P, and S100Z, making it the largest group in the EF-hand, calcium-binding protein family. Interestingly, 14 S100 genes are clustered on human chromosome 1q21, a region of genomic instability. Research studies have demonstrated that significant correlation exists between aberrant S100 protein expression and cancer progression. S100 proteins primarily mediate immune responses in various tissue types but are also involved in neuronal development (1-4).Each S100 monomer bears two EF-hand motifs and can bind up to two molecules of calcium (or other divalent cation in some instances). Structural evidence shows that S100 proteins form antiparallel homo- or heterodimers that coordinate binding partner proximity in a calcium-dependent (and sometimes calcium-independent) manner. Although structurally and functionally similar, individual members show restricted tissue distribution, are localized in specific cellular compartments, and display unique protein binding partners, which suggests that each plays a specific role in various signaling pathways. 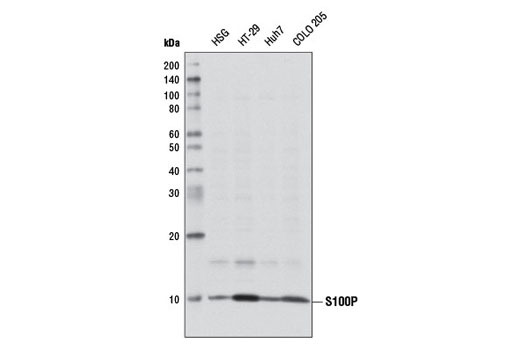 In addition to an intracellular role, some S100 proteins have been shown to act as receptors for extracellular ligands or are secreted and exhibit cytokine-like activities (1-4). Background: Members of the SALL gene family encode putative zinc finger transcription factors highly expressed during development (1). Sall4 is expressed very early in development with other pluripotency regulators, such as Oct-4 and Nanog (2). Recent studies suggest Sall4 works as a master regulator that controls its own expression and the expression of Oct-4 in a transcriptional regulation feedback loop governing stem cell pluripotency and stem cell fate (2,3). 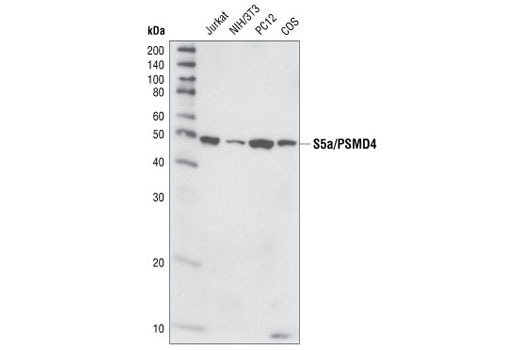 Immunohistochemical studies indicate that Sall4 is a sensitive and specific diagnostic marker for primary germ cell tumors and yolk sac tumors (4,5). 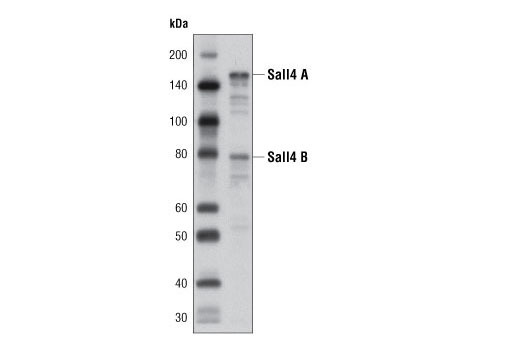 Research studies have shown that Sall4 is constitutively expressed in acute myeloid leukemia (AML) and is a probable effector of the Wnt/β-catenin signaling pathway in this disease (6). In addition, mutations in Sall4 have been implicated in human malformation syndromes including Duane-radial ray syndrome (Okihiro syndrome) and Acro-renal-ocular syndrome (7).